Bristol Sonics’ preparations for the 2016 summer Rugby League season take a step up this Wednesday (20th April) when they face military opposition at Landseer Avenue, home of hosts Dings Crusaders RFC. The Sonics will face the Royal Electrical & Mechanical Engineers (kick-off 7pm), in a match that should test the home side’s mettle ahead of the up-coming West of England League season. Player/coach Dom Swann will use the match, which will be played in four, 20-minute quarters, to test out combinations of players and give game time to new recruits and returning favourites. Since beginning pre-season training a few weeks back, the number of players taking part in sessions has been remarkably high. This upturn in fortunes can partly be attributed to a high number of new recruits, many of which are trying Rugby League for the first time. Dom Swann said: “There’s been a real buzz at training over the last few weeks, with both regulars and new recruits putting in a lot of effort. The intensity and quality on show has been obvious, and it definitely makes us all feel optimistic ahead of the new season. The Sonics next assignment, following Wednesday’s game at Dings, is the South West Nines on Sunday 1st May. The following weekend they will compete in the West of England Nines in Swindon on Saturday May 7 before beginning their West of England League campaign on May 14. Last year, the Sonics reached the West of England League Grand Final, losing to Bath & Wiltshire Romans in a thriller. This season, the Sonics are naturally aiming to go one better. 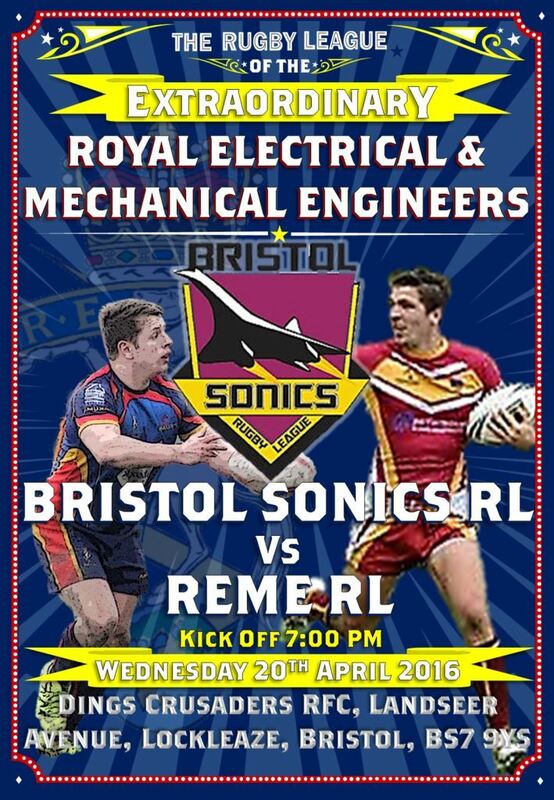 Bristol Sonics take on the Royal Electrical & Mechanical Enginners at Dings Crusaders’ Landseer Avenue ground on Wednesday, 20th April, kick-off 7pm. Entrance is free.